Is it rational or levelheaded to regard obscurantists as brash, unprincipled, and self-centered? That's how I feel when I try to read their writing. I refer only to those obscurantists who can, but have forsaken to, write plainly. I'm not chiding obscurantists who are incapable of writing plainly. 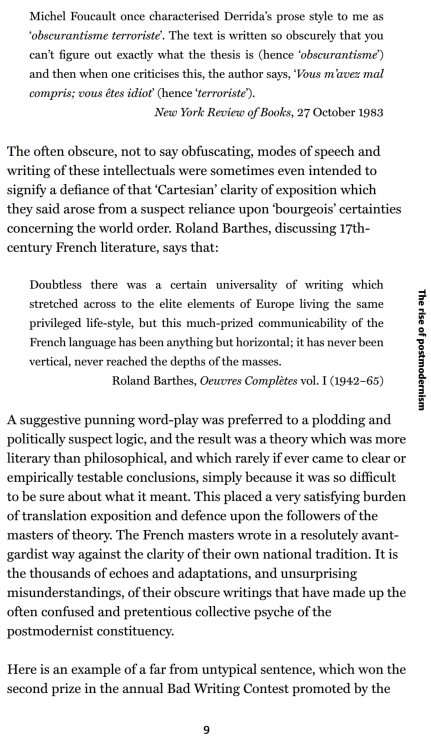 Postmodernism: A Very Short Introduction by Christopher Butler, Professor of English Literature at Oxford University. scholarly journal Philosophy and Literature. It may or may not become clearer to the reader by the end of this book, and it comes from Homi Bhabha’s much referred to The Location of Culture (1994). If, for a while, the ruse of desire is calculable for the uses of discipline, soon the repetition of guilt, justification, pseudo-scientific theories, superstition, spurious authorities and classification can be seen as the desperate effort to ‘normalise’ normally the disturbance of a discourse of splitting that violates the rational enlightened claims of its enunciatory modality. Understand Postmodernism: A Teach Yourself Guide, by Glenn Ward BA in fine art (painting), University of Plymouth, 1990; MA in Visual Culture, Bath Spa University, 1992; PhD in film studies, University of Sussex, 2011. p. 191. Psychoanalysis can therefore learn much from linguistics and should look harder at the linguistic processes involved in reading and speaking. For this reason Lacan’s writing is, like Jacques Derrida’s, dense with puns and wordplay. The unconscious, for Lacan, manifests itself in the way words fail to work. Thus the client in effect speaks the unconscious into being.